Clearly visualize your goals at a glance with a custom strategy map from Canva. Need to develop a simple, clean, visual representation of your business strategy? Then you’re in need of a good strategy map. In essence, a strategy map is a diagram that helps to visualize your organization’s objectives and the strategy to reach them. It’s especially useful for communicating the big picture to your team and have everyone working together towards the same goals. A strategy map must not only be well thought out, it must be well-designed. We understand that while strategy might come easy to you, design might not always be your strong point. 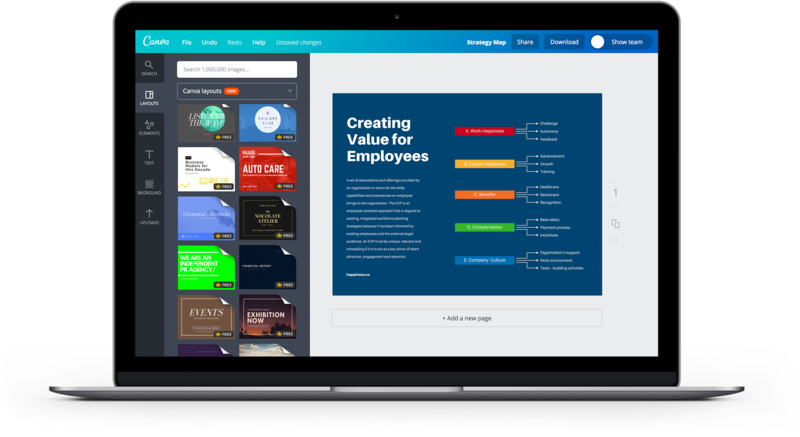 That’s why we’ve come up with templates to help you get started and easy, drag-and-drop tools to customize them. With no complicated design program to wrestle with, you will be dragging and dropping your way to your next million in no time. We say high five to that! Create a new Canva account to get started with your own strategy maps. Our amazing team of professional designers have done the bulk of the design work by giving you templates to customize. With a professionally-designed template, you can concentrate on the nitty gritty details of your strategy map and just tweak some elements until it suits. Choose from over a hundred fonts to jot down your goals and plans to achieve them. Try mixing and matching Serif and Sans Serif fonts to capture the exact mood you want to convey. Show correlations and cause and effect relationships by using arrows and lines. Represent different steps by using shapes. Just head to the elements tap and choose from any of the hundreds of icons and shapes available.Of course, you need not follow this exactly if you’ve got a different style. That’s the great thing about designing in Canva—everything’s completely customizable. The world is more exciting in color, so make sure your strategy map is eye-catching and informative – you don’t want your team falling asleep on the job. Start by assigning different colors for each metric, element or objective – so everyone is crystal clear on what needs to be done by who. Use Canva’s color palette tool to choosing any hue in the color spectrum or type in a specific hex code if you have specific guidelines for your brand identity. Because Canva lives in the cloud, you can work on your strategy map with your team, no matter where they are in the world. With access to your design, they can share feedback and ideas from any desktop, laptop, iPhone, iPad or Android device. After you are done, it’s as easy as sharing a link to your design. You can choose to give them editing access or just have them view it. You can also download your design as a high-resolution JPEG, PNG or PDF file, ready for printing. How can I add and use shapes and lines in my design? To add a shape or line to your design, click on the Elements tab on the object panel. Select either the Shapes folder or Lines folder. Pick from the various choices of shapes and lines to add it to your design. To delete a shape or line, select the element you wish to delete, then click on the Trash icon on the toolbar. Can I edit my strategy map design after I've saved it? Canva is a fully online design platform. Simply head on over to www.canva.com to start creating your strategy map. You don’t need to download Canva, just create an account and log in. If you want to design on the go, download our iPad and iPhone apps from the App Store and our Android app from Google Play for free.